Environmental harms exert a significant toll and pose substantial economic costs on societies around the world. Although such harms have been studied from both legal and social science perspectives, these disciplinary-specific approaches are not, on their own, fully able to address the complexity of these environmental challenges. Many legal approaches, for example, are limited by their inattention to the motivations behind environmental offences, whereas many social science approaches are hindered by an insufficient grounding in current legislative frameworks. This edited collection constitutes a pioneering attempt to overcome these limitations by uniting legal and social science perspectives. Together, the book’s contributors forge an innovative socio-legal approach to more effectively respond to, and to prevent, environmental harms around the world. Integrating theoretical and empirical work, the book presents carefully selected illustrations of how legal and social science scholarship can be brought together to improve policies. 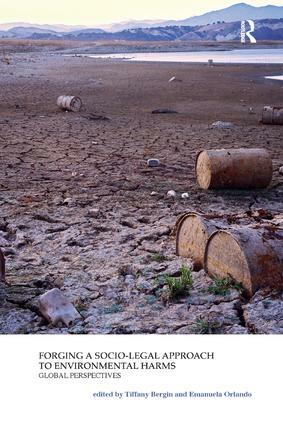 The various chapters examine how a socio-legal approach can ultimately lead to a more comprehensive understanding of environmental harms, as well as to innovative and effective responses to such environmental offences. Tiffany Bergin is Assistant Professor in the Department of Sociology at Kent State University, USA. Previously, she was Sutasoma Trust Research Fellow and Director of Studies in Politics, Psychology and Sociology at Lucy Cavendish College, University of Cambridge. Emanuela Orlando is Lecturer in Environmental Law at the School of Law, Politics and Sociology of the University of Sussex. Her main research interests lie in the area of EU and international environmental law. Prior to fully engaging in an academic career, she worked for major international law firms and the European Commission, and served as legal adviser for the Italian Ministry of Environment, Land and Sea (IMELS) in the framework of its bilateral cooperation activities in the Balkan countries.